April | 2014 | Are there chicken sheds in heaven? The below article published in The Telegraph a week ago made me half want to laugh and half want to cry. On the one hand – yes, if you’re going to eat dairy then you might as well eat veal I guess. Thousands of unwanted calves is just one of the many necessary evils of the dairy industry that no one likes talking about. To get cows producing milk, they’ve got to have produced a calf, but then if we want to steal her milk then we have to take the calf out of the equation. The options – bullet, veal or export. None are very appealing but these sadly are the fate of every single calf born to a dairy cow and if you don’t want to be part of this horrid cycle then you need to stop consuming dairy. But surely the whole blindingly obvious point is that none of these is preferable to leaving these calves alone to enjoy the milk from their mother, the milk that was intended for them, the milk that we humans do not need. ‘Brend’s animals go to the abattoir at six months, which means they don’t have to be dehorned or castrated as older beasts often are. And yes, it’s not very old – but it’s a similar age to pigs and lambs. Alice Swift, Sainsbury’s beef and dairy agricultural manager and a farmer’s daughter herself, insisted, “It’s the number of happy days that count.” ‘ Oh well that’s ok then. SERIOUSLY?!?! ‘After all, we have to find something to do with the male calves from the dairy industry – so yes, vegetarians, you need to listen up too, as veal is a by-product of cheese, cream and milk.’ – umm… or we could just stop eating dairy altogether and hey presto, problem solved. ‘Some farmers have resorted to shooting the male calves soon after birth, which Brend insisted to me that they hated doing. “But it’s better than just leaving them to starve,”’. Well quite… how compassionate of you Mr Brend. The production of veal got a bad name in the Eighties but higher-welfare practices mean we can now enjoy this delicate meat without the guilt trip. When farmer Mike Brend sits in his office, the view through the picture windows is not of the Devon countryside around his farm. He looks straight into the long airy shed that houses his kindergarten of calves, some close enough to lick the window in front of his laptop. The young stirks – farmerspeak for a bull calves – are surplus from one of the 320 dairy farms that supply Sainsbury’s with their milk, and will produce the supermarket’s higher-welfare veal. And no, before you shudder, veal isn’t cruel – not this veal anyway, which is endorsed by the RSPCA’s Freedom Food scheme. Times have changed when it comes to veal production. The vilified system of housing veal calves in crates so small they can’t even turn around was outlawed in the UK in 1990. Europe followed in 2007, although according to Compassion in World Farming, on the Continent the animals are often kept in sheds with slatted floors, rather than the higher-maintenance but more comfortable straw that Brend’s calves enjoy. In fact, it’s time we rehabilitated the pale, delicate meat that has a long gastronomic tradition in dishes such as osso bucco and saltimbocca. After all, we have to find something to do with the male calves from the dairy industry – so yes, vegetarians, you need to listen up too, as veal is a by-product of cheese, cream and milk. The problem is (and apologies to those of you who already know this) that to keep a dairy cow producing milk, she has to calve regularly – around every 13 or 14 months is usual. When the calf is a female, she can grow up to be a dairy cow like her mum. But the male calves fetch as little as £5 a head at market, and as adults the dairy bulls and bullocks (aka steers, castrated males) are felt not to make good beef. The carcass has a low meat-to-bone ratio, and the prime cuts, the sirloin and the fillet, are smaller. The result is that they are classified as the lowest grade, P for Poor, at the abattoir and fetch as little as a pound a kilo, not enough for the farmer to break even on feed and care costs. Brend is not alone with his passion to bring veal back. A small but growing number of frustrated farmers have returned to veal production, attempting to bring around the British to eating ethical veal. 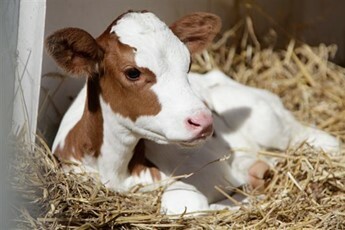 Most are producing rose veal, a pink-coloured meat, darker than traditional veal, made with young animals up to about eight months old, raised on beef feed. Some, but not all, will go out to pasture in the summer months, and a very small number, like those produced at Helen Browning’s Eastbrook Farm, continue to feed from a “nurse cow”, usually a retired dairy cow rather than the actual mother. Sainsbury’s scheme is different on a couple of counts. One is that the farmers are guaranteed a price for their veal calves that is “decoupled” from the market price. This means it is based on cost of production and a reasonable profit, regardless of the fluctuating market price, something that Brend, a first-generation farmer with three children under five to support, finds reassuring. The second difference is the one that matters to cooks. The calves are fed on a diet of just milk along with barley straw, essential for the roughage to allow their guts to develop properly. The result is a pale veal that is closer to traditional, old-fashioned veal in flavour, but without the appalling welfare issues. Only a couple of thousand calves are raised this way a year, in six farms as well as Brend’s, a fraction of the total number of male calves born on Sainsbury’s farms. But the market is growing and Sainsbury’s recently hit £1 million worth of sales in the 18 months it has stocked higher-welfare veal. And looking ahead, Compassion in World Farming would like to see a movement back to mixed-use herds, where most of the cows are impregnated with beef-breed sperm, such as Angus. The resultant mixed-breed calves can be reared for beef, while the mother goes back into milk production. Back home, I cooked up two veal escalopes, one indoor-reared rose veal from Brookfield Farm in Dorset, the other milk fed from Brend’s herd. Raw, they looked much the same colour, a muted red. But once cooked, the difference was striking. 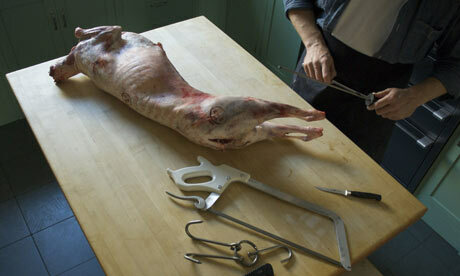 The rose veal was darker, a pale beef colour, with a pronounced grain. The milk fed was pale as chicken breast, and fine-grained, velvety textured. Both were delicious, the rose with a clean beefy flavour, while the milk fed was delicate, sweet and, yes, milky – closer to chicken than beef. So, take your choice. Outdoor-reared rose is probably the gold-standard welfare choice, but bear in mind that in winter at least it is likely to be indoor reared anyway. For flavour, the rose veal is excellent simply cooked but will stand up to stronger sauces too. But for the veal that Escoffier would recognise, for the classic French dishes, the milk fed is the one. As for the welfare, Helen Browning, chief executive of the Soil Association as well as a farmer, was pragmatic. “This may be a halfway house, but it is a good place all the same.” Just make sure it is British. A classic saltimbocca is a veal escalope with a single sage leaf pressed on to the soft pink meat, then wrapped in a slice of air-dried ham, before frying in butter. It’s excellent, salty, savoury and sage-y. At this time of year the young top leaves from the traditional hard herbs – rosemary, sage, thyme and bay – have a less powerful flavour, so you can afford to be a little more generous. If you don’t have herbs growing on the windowsill or in the garden, then the tender pots from the supermarket will do very well. Lemon thyme is particularly good. Lay the veal on a chopping board and, with the base of a saucepan, bash it until it is about the thickness of a pound coin. Cut the escalope in half and press the leaves on to the veal, spacing them well. Wrap each piece in prosciutto – depending on the size of your escalope and ham, you may need only half a slice per half escalope. Chill, covered, until you need them. To cook, drop the butter into a hot frying pan, and when it is foaming add the saltimboccas. Cook until lightly browned on each side – be very careful not to overdo the meat. Lift the saltimboccas on to a warm plate, then add the wine to the pan, stirring and scraping as it bubbles. Pour over the meat and serve with Jersey royals and purple sprouting broccoli, plus a lemon wedge to squeeze over. 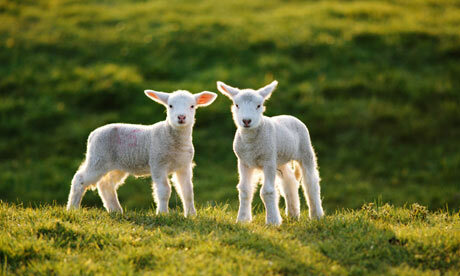 “If you like the sight of lambs playing in the fields and cattle grazing in the meadows then you should really eat meat. You can’t have it both ways”. Hmmm…. Yes I do like the sight of lambs playing in the fields at this time of year – but the knowledge that those lovely lambykins will be slaughtered at around 20 weeks old so that we can enjoy its succulent juicy flesh with a dollop of mint sauce and redcurrant jelly just doesn’t seem right to me. 20 weeks. What kind of life is that? That’s the equivalent (pro rata in average life expectancy) of killing a human at 18 months old. Not what you’d call a great innings is it? It’s bizarre isn’t it that we are so far removed from the brutal reality of this industry that we sit there and tell ourselves that because we love seeing these animals roaming about the fields, that in some way justifies the means. It’s actually quite an amusing argument. except of course that it’s not. It’s incredibly naïve, hugely hypocritical and a deeply misguided sentiment entirely. How to stop global warming? This extraordinary movie made by the Nicolaas G. Pierson Foundation from Holland shows us the whole and bitter truth about the influence of the meat industry on our climate and on the devastation of our environment, water, and air.